I’m a front porch girl! 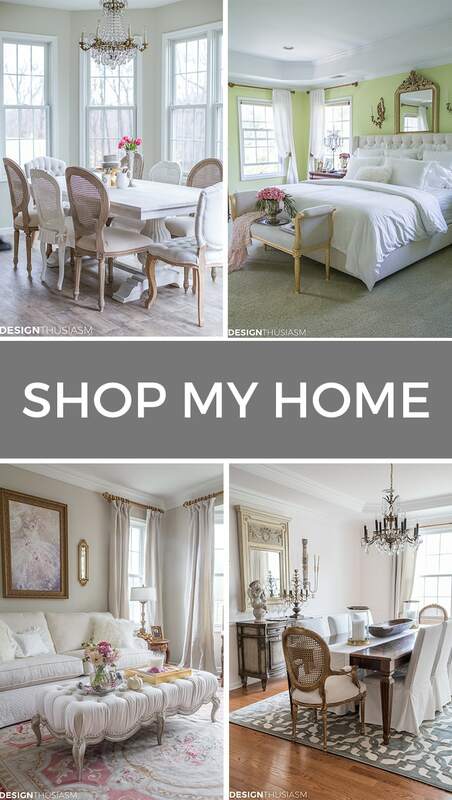 I love homes with large verandas that can be separated into sections and decorated accordingly. What a pleasure it is to sit on such a perch and watch the world go by! Unfortunately, my front entry is pretty much the opposite of that. It’s every so tiny with an enclosed feel, made even more claustrophobic by the stone overhang and columns. Our stair railings are set closer than necessary leaving little room for adorning the stairway, as well. 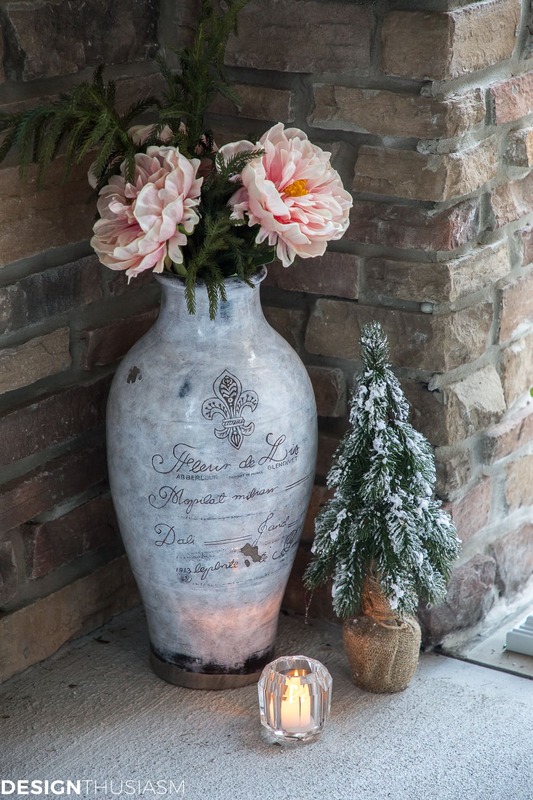 And yet even so, each year I try my best to add holiday cheer to welcome guests to celebrate in our home. Perhaps I make it more difficult by insisting on keeping a bench here, but it does fit comfortably and offers increased decor opportunities. Above the bench I placed a pretty wreath, with bits of gilded branches, rugged pine cones and small metallic ornaments. 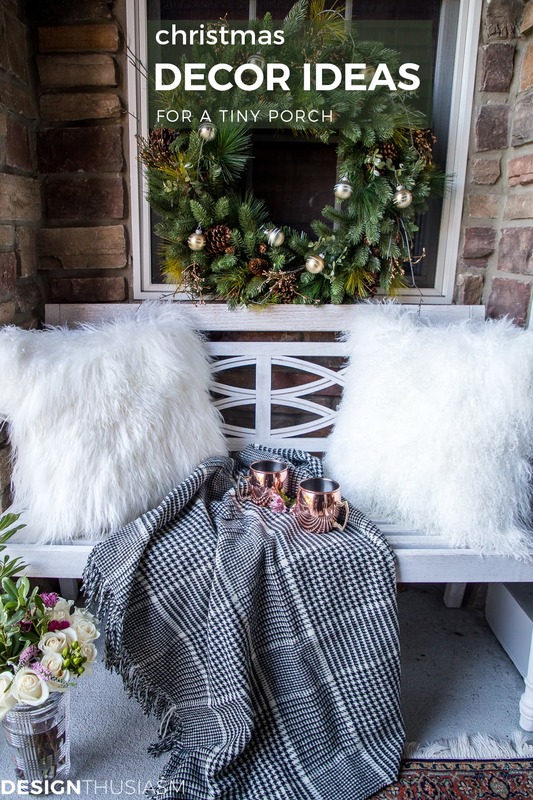 Since I love to sit outside, fluffy Mongolian lamb pillows and a wool plaid blanket are both functional and a visual reminder of the winter season that’s arrived. I kept the palette soft in mostly white and green with little flecks of cheery pink. With space so limited, I have to make use of the corners. 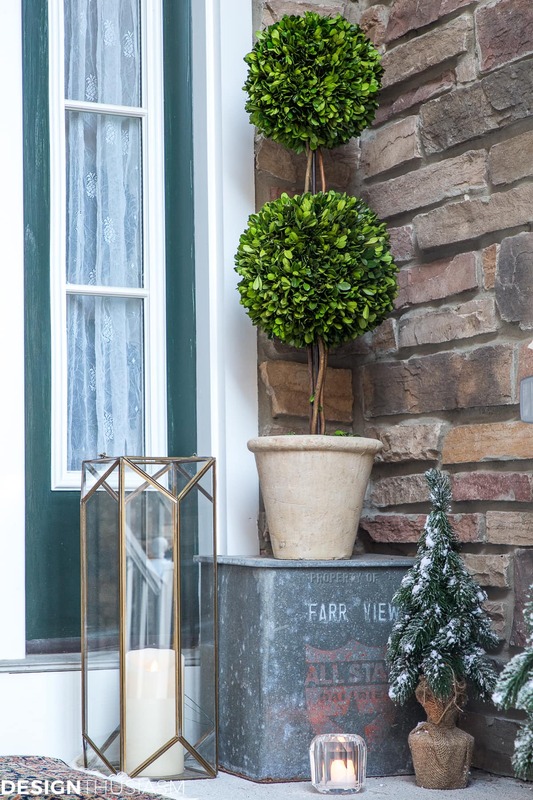 I keep a vintage mailbox outside all the time, and I added a boxwood topiary, varied candles, and tiny burlap-wrapped flocked trees. 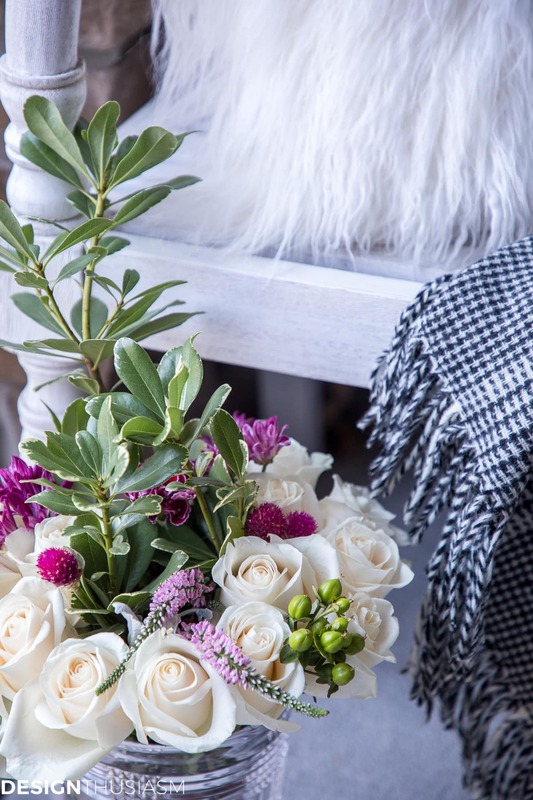 Another corner hosts a tall vase with faux flowers and draped greenery. 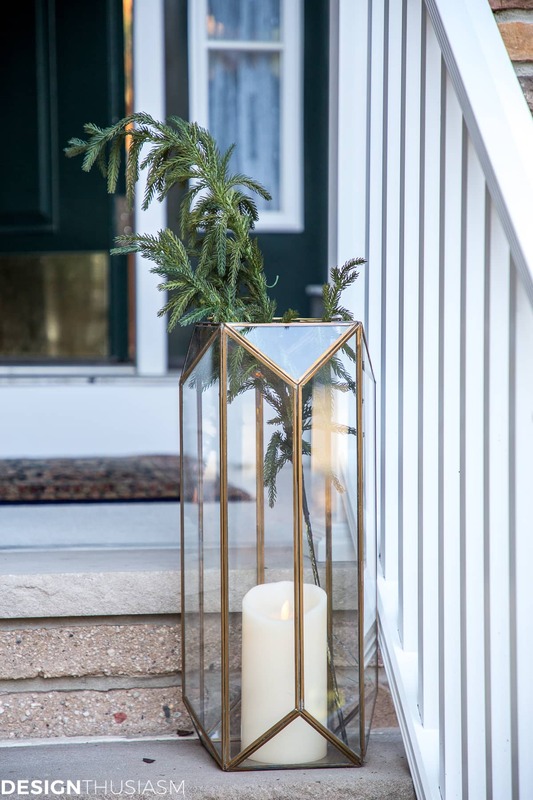 The brass and glass lanterns are a new addition, small and sleek enough to fit on my narrow stairway. 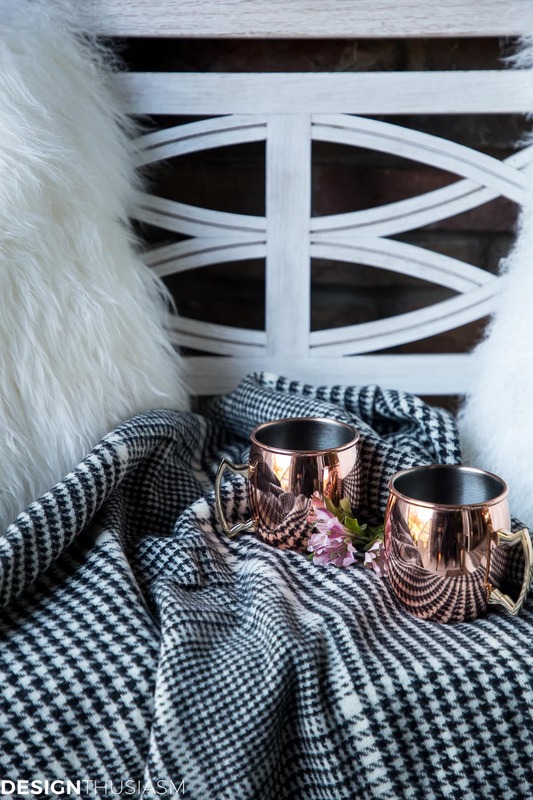 Even on my tiny porch, I enjoy sitting outside, sipping hot cocoa while wrapped in a blanket, waiting to greet guests who drop by to enjoy the season. 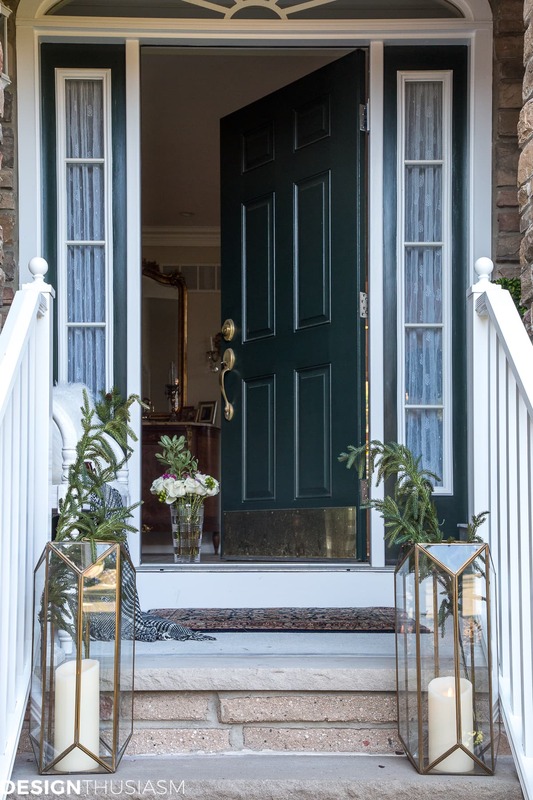 We’ll head inside to a warmer and more spacious place to celebrate, but the welcome is nonetheless more charming with a decorated, albeit tiny, front porch! 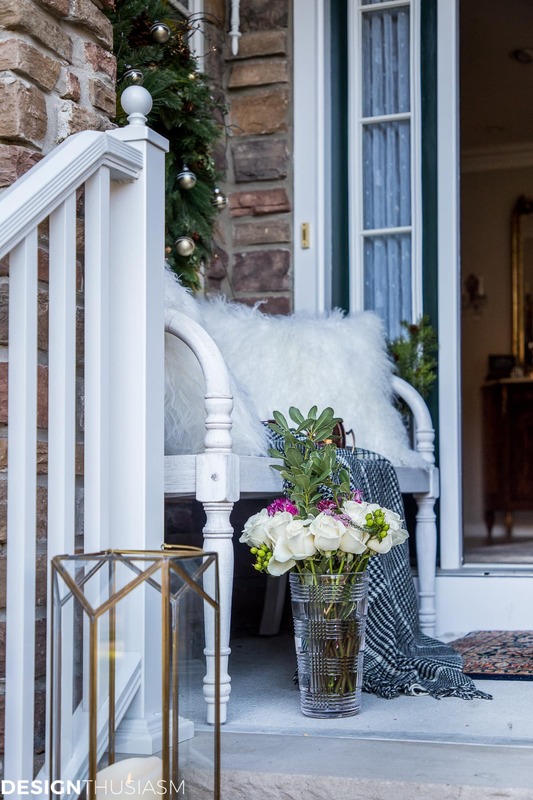 Christmas Porch Decorating Ideas resource list – To get the look, click on the items below for direct links to the products. Where actual items were no longer available, I’ve provided similar options. Hardly a porch, at all but you’ve decorated it as one. A most lovely welcome!